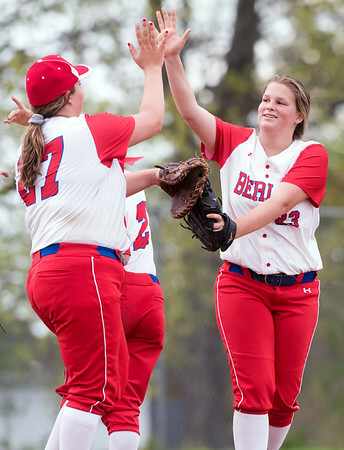 BERLIN - If you’re a veteran on the Berlin softball team, chances are you’ve played almost every position in the field. For the last four years, the seniors, such as Michelle Cohen and Alexa Lanteri, have been rotating positions and gotten plenty of experience learning the different nuances of the game. It’s also an important trait the Redcoats need to have as players. Berlin has seven seniors leading some young talent, with just 15 girls on its roster. That’s why the seniors’ leadership this season has been so important. With players like Stefanie Poulin, Jenna Zup, Kylie Lanteri and Casey Uryga - all freshmen - getting significant playing time, having veterans that can show them how things should be done and what is expected from each position is critical. For the seniors on the team, including Cohen and Lanteri, that means they want to finish the season strong. In order to achieve their goals, there are some things that the team needs to improve upon. Posted in New Britain Herald, Berlin on Tuesday, 15 May 2018 20:31. Updated: Tuesday, 15 May 2018 20:33.